The smalltooth sawfish (Pristis pectinata) is one of five sawfish species living in tropical and subtropical rivers, lakes, and coastal areas worldwide. They are a fish characterized by long life, slow growth, late maturity, and low fecundity, making them extremely vulnerable to any changes that may reduce their population. In addition, the introduction of humans and their gear into sawfish habitats has created a new problem: sawfish rostra (saws) can easily become entangled in nets and fishing gear, making them vulnerable targets for overfishing. As humans expand into sawfish territory, leading to habitat destruction and population decline, sawfish are forced out of their previously large range and into smaller and smaller pockets of territory. Historically, smalltooth sawfish migrated along the east coast as far north as North Carolina. Historically, largetooth sawfish (Pristis pristis) inhabited Gulf of Mexico waters from Florida to Texas. At this time the largetooth sawfish is thought to be functionally extinct from Florida, with most sightings taking place in Texas waters and recent captures occurring in Central and South America. The decline in sawfish populations worldwide has prompted the International Union for the Conservation of Nature and Natural Resources (IUCN) to list all sawfish species as “Endangered” on the IUCN Red List. Sawfish are also the only elasmobranch included in Appendix 1 of the Convention on International Trade in Endangered Species (CITES) which prohibits any commercial trade in those species. Based on the contraction in range and anecdotal data, the current US population is likely to be at a level of less than 5% of its size at the time of European settlement. This severe decline in population led to two petitions: the Ocean Conservancy’s 1999 petition to have smalltooth sawfish listed as endangered under the Endangered Species Act (ESA), and the National Marine Fisheries Services (NMFS) decision to grant that stus on April 1, 2003 (68 FR 15674). Smalltooth sawfish are the first marine fish to receive protection under the ESA. Smalltooth sawfish are currently limited to waters off the Florida coast to the southwest, and it is illegal to catch, possess, or injure a sawfish. However, fishermen catch them incidentally while fishing for other species, leading the NMFS to develop guidelines for the safe handle and release of accidentally caught sawfish. These new levels of protection will hopefully help the sawfish recover to its previous levels of abundance within United States waters. Though the initial review taken after the sawfish were elevated to “endangered” status suggests that the population has stabilized, it will still take many generations for it to rebuild and meet the goals set by the Sawfish Implementation Team. Sawfish are still at risk due to a depressed population size, continued restricted range, and the continuing threat of habitat degradation and incidental capture. – Report encounters. With populations in decline, all information about this species is invaluable. You can greatly help conservation efforts by reporting any sawfish encounter and spreading the word that encounters should be reported. – Distribute flyers. Our flyer can also be used as a tri-fold brochure, allowing it to be posted in windows and boards as well as brochure supports. Download our flyer and post it any place you think it can be read by people visiting potential sawfish habitat. – Increase public awareness. The more people that know about the importance of reporting sawfish encounters, the better for the smalltooth sawfish. We need to increase public awareness to obtain the most timely and accurate information. Thank you for helping us assist in the recovery of the U.S. smalltooth sawfish population by reporting your sawfish sightings! Are sawfishes threatened or endangered? The International Union for the Conservation of Nature and Natural Resources (IUCN) Red List of Threatened Species categorizes all sawfishes as endangered. The smalltooth sawfish (Pristis pectinata) and largetooth sawfish (P. pristis), in addition to the IUCN Red List designations, are listed under the US Endangered Species Act of 1973 as endangered species. Visit the IUCN Red List site. What are some threats to sawfishes? Threats to sawfishes included both human-induced and natural causes of injury or mortality. Human-induced threats include the reduction of coastal habitat through human modifications (i.e., construction of dams, dredge and fill practices, coastal armoring), pollution-related injuries and death, and landings of sawfishes as bycatch and in targeted fisheries for their meat, liver oil, fins, skin (leather), and rostra. Natural threats to sawfishes are poorly known, but include predation by sharks and other large predators, and mortality attributable to red tide (including the dinoflagellate Karenia brevis). Why should we protect sawfishes? Sawfishes are important members of tropical and subtropical estuarine communities. Like other top predators, sawfishes perform a valuable function in culling out sick or injured prey species such as schooling fishes, crustaceans, and cephalopods. Sawfishes may play a number of other important roles in estuarine communities that science has not yet learned about. In addition, sawfishes have for centuries been important to humankind both as valuable food and medicinal resources, and as religious and cultural symbols. Is it legal to buy and sell sawfish saws in the U.S.? The Florida Program for Shark Research strongly discourages the trading of sawfish parts, including sawfish fins and rostra (also called “saws” or “snouts”). Sawfish populations worldwide are thought to be seriously depleted and are categorized as Endangered by The IUCN Red List of Threatened Species, and every effort should be taken in reducing incentives to land or wound these remarkable animals. The trading of smalltooth sawfish (Pristis pectinata) parts, including rostra, meat, and fins, is prohibited in the United States, since this species has gained protection under the US Endangered Species Act of 1973. The enforcement of this new listing began on 1 May, 2003. This includes exportation and importation in and out of US boundaries, and the moving of smalltooth sawfish rostra across state boundaries (even without sale), without first obtaining a permit allowing you to do so. Persons documented buying or selling smalltooth sawfish parts within state boundaries can also be convicted of an illegal act, as the courts have interpreted interstate trade very broadly in the past. The only exception to the prohibition on trade in smalltooth sawfish parts in the US is in the instance where there is documentation that proves that it was obtained more than 100 years ago. In addition to federal ESA protection, the trade of rostra and other parts from this species has been banned under both Florida and Louisiana laws. The trading of largetooth sawfish (Pristis perotteti) parts, including rostra, meat, and fins, has been banned by state law in Florida and Louisiana. As of May 2010, the largetooth sawfish is under review for listing as a federally endangered species for protection under the US Endangered Species Act. The information given above should not be considered fact, as we are not experts of US wildlife law, and laws concerning sawfishes may change more often than we are able to update this web page. For specific information concerning the trading and possession of sawfish rostra, please contact the appropriate governmental agency. Are sawfishes protected throughout the world? On June 11 2007, Kenya and the U.S. introduced proposal CoP14 Prop 17 to The Convention on International Trade in Endangered Species of Wild Flora and Fauna (CITES) supporting the listing of all seven species of sawfish under Appendix I. Currently, six of seven sawfish species are listed under Appendix I of CITES. The seventh species, the freshwater sawfish (Pristis microdon), is listed under Appendix II, allowing the trade of live animals to aquaria only. The Australian government introduced an amendment to the CITES proposal to permit the live trade of Pristis microdonto aquaria. They reported that the population in Australia was robust and could support a limited trade for displays to aquaria to raise public awareness and increase conservation efforts. Australia is the only country permitted to export live sawfish specimens. Appendix I of the CITES prohibits the international trade in specimens of the six species except when the purpose of the import is not commercial, i.e. research, and requires an authorized import permit and an export permit (or re-export certificate). International trade in Pristis microdon, under Appendix-II, may be permitted with an export permit or re-export certificate. No import permit is necessary for these species under CITES (although a permit is needed in some countries that have taken stricter measures than CITES requires). Are there any public aquariums where I can see a live sawfish? Yes, there are quite a number of aquaria where you can view a live sawfish in captivity. Sawfishes currently kept in public aquaria include: the dwarf sawfish (Pristis clavata), the largetooth sawfish (Pristis pristis), the smalltooth sawfish (Pristis pectinata), and the green sawfish (Pristis zijsron). To the author’s knowledge, the narrowtooth sawfish (Anoxypristis cuspidata) is currently not being displayed in any public aquaria. What should I do if I encounter a sawfish in its natural habitat? Sawfish are listed under the Endangered Species Act which makes it illegal to harm, harass, or handle them in any way. If you do see a sawfish, enjoy the moment and feel extremely lucky! It is illegal to hook or net one, except with a permit or in a permitted fishery. Accidental captures do occur while fishing for other species; if a sawfish is hooked or netted, it should be released immediately. Remove as much fishing gear as safely possible – DO NOT REMOVE THE SAW. For more information on safely releasing a sawfish, reporting a sawfish, or more advice, visit our Sawfish Encounter web page. What is the safest way to release a captured sawfish? If it can be done safely, untangle the line if it is wrapped around the saw and remove as much of the line as possible. Cut the line as close to the hook as possible. Do not handle the animal or attempt to remove any hooks on the saw unless you have a long-handled dehooker. Make every effort to free the animal from the net with minimal additional stress or injury. Keep sawfish, especially the gills, in the water as much as possible. Try to remove all the netting and release the animal quickly. DO NOT REMOVE THE SAW! Warning: Sawfish are large, powerful animals that can cause serious injury. For your safety, and the safety of the sawfish, use caution if you do hook or net one of these animals. What can I do to help sawfish conservation efforts? Are scientists learning more about sawfish through research? Yes, there is still much to be learned regarding the biology and ecology of all of the sawfish species. 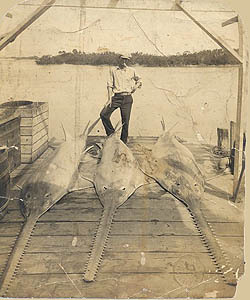 Scientists and fisheries managers have essentially overlooked sawfishes for centuries. 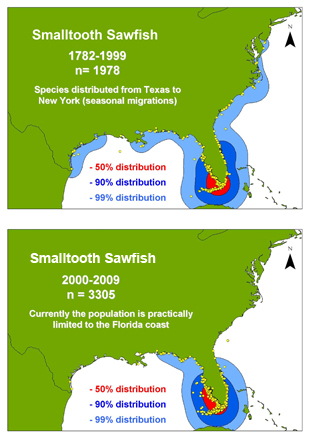 Only recently has the plight of sawfish populations been realized and more research is now underway to answer critical questions relating to age and growth of the smalltooth sawfish, critical habitat requirements of the species, and the reduction in the range of this species in the US. What do scientists still need to learn about sawfishes? There is much to be learned still regarding all species of sawfishes. The only species that has been well studied thus-far is the largetooth sawfish (Pristis pristis). Science knows more about the age and growth, reproduction, and movements of this one species that all the other species of sawfishes combined, thanks to the efforts of the now-deceased ichthyologist Thomas Thorson, who conducted extensive studies on this species in Nicaragua. Scientists in the US are particularly interested in learned more about the age and growth, reproduction, movement patterns, and habitat utilization of the smalltooth sawfish (Pristis pectinata), because of the need to allow population recovery to begin for this endangered species. What are some good references and resources to learn more about sawfishes?